"Oh, God, look where they're camped," Tommy groaned over the noise of the Super Cub's engine. "Dumb college kids!" I smiled, having known where the camp would be, and the reaction it would elicit from Tommy. It was on a narrow ledge a few feet above the creek, a product of water erosion in the distant past. At its head the rugged glacier moraine lay, while along one side the tree-covered mountain slope climbed to jagged peaks where Dall Sheep could be seen feeding. Below it a bit, on the other side, the creek flowed over its rocky bed, and beyond the creek the mountains rose once again. Off the glacier the wind poured, gusts and eddies creating pools of wild turbulence, and things would only get worse as the day progressed. "Coulda used the place downstream," Tommy grumbled, referring to the nice open spot with good approaches a mile and a half away, as I began the steep downwind turn, the sideways drift pronounced. A spot where tight 180 degree canyon turns in treacherous winds low to the ground were not necessary. But it was not to be. These kids had come up from California on a field trip (Alaska 101?) with their teacher, and were used to having things easy. They had money, and they expected service. Well, for the price I was charging for this little extra job, service was what they would get. Air drops were one of my specialties. Unfortunately, today's drop, because of the camp's location, would have to break most of the rules. Counterbalancing that disadvantage was the fact I had Tommy's skills to draw upon. Good help in this business is hard to come by. Flying my downwind leg, I thought of how I had gone into the small strip at the entrance to the valley yesterday morning with the C-180 to pick them up and fly them out as scheduled. But the kids were not there, only a stick stuck in the ground and braced with a pile of rocks. On it, tied with shroud line and marked with surveyor's tape, was a plastic Ziploc bag. Inside the bag was a note. They were going to spend an extra ten days in the valley, and wanted me to airdrop additional supplies. I was also to make a phone call to California to notify one of their parents of the change in plans, so no one would send out a search party. There followed a long list of items to get, including fresh eggs (air drop? ), film, and a couple of cases of beer. They would pay the charter rate for me to go into town and do their shopping. All this was fine with me; that was what I was in business for. Turning into the wind, passing through my IAF window, I couldn't help grinning at the expression on Tommy's face when he heard about it, and saw the mountain of supplies which I had already packed for the drop. And now he was sitting in the back of the Super Cub with the baggage compartment stacked full, and the first bundle waiting on his lap, no doubt still shaking his head. "Okay," I called to Tommy, by far the best man I had ever worked with on air drops, a genius on matters of trajectory, airspeed, and placement. "Open 'er up. We're ready to go." During World War II he had been an Air Force bombardier, and his lessons had certainly taken. Tommy reached over and opened the door of the Super Cub, letting it fold down, then raised the window and pressed it into its catch. The wind roared in, picking up a little dust from the floor, and at that point I turned my complete attention to flying. When doing air drops, or game evaluations, the workload has to be split into two sections: the flying, and the dropping or evaluation. It is a two-man job. In this business, as the accident statistics make clear, the pilot who tries to do both does not survive long. We descended over the stream bed, the wind rocking us, approaching the ledge from an angle. Out my window I could now see the kids waving, standing in a group, but out of the way, then we were over the ledge and I leveled the wings for a moment so Tommy could drop the first package out, surveyor's tape streaming. The turbulence was all I expected it to be, almost too much, then the package was out, rolling along the ground, and I wrapped the Cub around into a steep 180 degree turn, the wingtip just six or seven feet off the ground, the towering glacier moraine momentarily close enough to pick out tiny details. Then it was behind us as I climbed out and let the wind blow us down the canyon again. "Well, that's one down," Tommy said in an amused tone of voice. "Only six more to go." I tossed a quick glance his way. It was as I expected. He had an ear-to-ear grin, all traces of his earlier moodiness gone. He was one of those guys that got more cheerful as the going got rougher and rougher, a trait that endeared him to me. A good man to have by one's side when the chips were down. His Air Force group thought so too. So we made another pass, and another drop, then another and another. With each pass the wind got worse, the turbulence greater, Tommy more cheerful, and me more focused. Then we were done, and on our way back to my base of operations. But not to rest. The morning was just getting started, and we still had a long day ahead of us. If, as they say, there is no rest for the wicked, then we were in bad shape indeed; for, during the season, our days started early and ended late, and holidays were unthinkable. Okay, let's gird out loins and admit it: flying low is a dangerous practice, frowned on by all right-thinking pilots except those involved in military, agricultural, and bush operations. We have the grim FARs to remind us of this, and the even grimmer accident statistics. The military plows into the ground on a regular basis, the ag boys hit wires and wingtips, and every season hunters spin in over moose and bear. Yet, it's gotta be done, no way around it. Low-level flight, sometimes referred to as nap-of-the-earth, or contour flying, is just too much a necessity in our business. Since this is the case, it's best to learn how to do it right. The techniques are simple and straightforward, and, when combined with judgment and the appropriate level of flying skill and aircraft familiarity, becomes reasonably safe in the hands of an experienced pro. Inspection of terrain from the air prior to an off-airport landing. Landing and departure paths that, due to technical necessity, must hug the terrain. Air drops of supplies and equipment (a team operation). Animal population studies of mountain sheep, goats, caribou, moose, wolves, and bear (a team operation). Big game spotting by hunters (similar to the above, and also a team operation. Photographic missions, both still and moving (a team operation). Charting prospective roads or trails (a team operation). Note that out of the eight listed situations requiring low-altitude operations, over half of them involve a team effort. And of those, by far the most accidents are caused by only one activity: big game spotting. Therefore, the greater part of this chapter will focus on how to safely evaluate big game from the air for hunting purposes. But first we need to take a look at a few of the general requirements for learning this advanced skill. During your study of contour flying, there is a serious danger/temptation of which you must be cognizant. This danger/temptation (called "The Devil Made Me Do It!") comes from, and is, a product of the learning curve. For, as with any other complex skill, such as instrument flying, or playing a musical instrument with world-class subtlety, contour flying requires both careful study and regular practice. Unfortunately, contour flying is more akin to learning a serious musical instrument, such as the viola or cello, than it is to instrument flying, and as a result takes a lot longer before real proficiency is obtained. Low-time pilots, especially those afflicted with macho personalities, find this galling, and often push themselves beyond their current level of ability, hitting the evening news as well as the ground. It should be kept in mind that serious contour flying requires true in-depth mastery of the airplane, and this mastery does not come overnight. The development of a precise awareness of what degree of control lead will be required under various conditions of weight and ground speed to pass over or around obstacles while maintaining the desired terrain clearances. The development of a precise awareness of what horizontal clearances will be required for turns through 180 and 360 degrees under varying conditions. The development of a solid awareness of the shifting aspects of depth perception under different conditions of lighting, altitude, and terrain. The development of a marked ability to maintain complete concentration on the job at hand -- which is flying the airplane -- while leaving other considerations (such as, "My God, look at the size of that ram!") to your spotter. These skills, after a period of development that usually takes a few years, along with a couple of thousand hours in the various airplanes being used, eventually combine into an ability to precisely visualize your track within your mind (exactly as is done with approaches) in advance of the proposed maneuver, and this is the key to safe contour flying. How close to the terrain you can safely and consistently operate is completely dependent upon how precisely your inward vision corresponds to reality, and the best pros, when using a Super Cub, are capable of operating safely -- under calm air conditions -- within about three feet vertically during straight-and-level, and thirty feet horizontally during 180-degree turns. There are a few basic principles involved in contour flying, and these principles will go a long way toward keeping you safe. Let's review them briefly, along with basic control techniques, before going on to their practical application in big game evaluation. The pass (used both in air drops and hunting) should always be set up as a landing approach, with the target just to the side of the imaginary strip. The go-around should be well planned, with flaps, trim, prop, and power set accordingly. You will, as always, have your key windows, just as you would for a real approach. The pass should always be made downhill if at all possible. This is especially important in narrow canyons, and was one of the rules that had to be broken during the airdrop episode described earlier. Tight downwind turns in strong winds should be avoided whenever possible. If necessary, they should be performed without ground reference. Here you are making your turn in a rapidly moving body of air, and the turn has to relate to the air mass, not some spot on the ground. During the turn, sideways drift will be quite pronounced, and trying to remain over a landmark -- say, a trophy moose or bear -- will just lead you into tightening the turn until you stall and go spinning in. This is a real "gotcha," and manages to get one or two pilots almost every year. This, too, was one of the rules that had to be broken during the airdrop, and if you think back on the chain of events, the sideways drift was every bit as pronounced as was expected. Whenever possible, turns should not be made after the pass until an altitude of approximately 200 feet AGL has been reached (this joins the long list of rules that had to be broken on the air drop). Airspeed is controlled by elevator, especially in or approaching the area of reverse command. Short-term excursions from the basic flight path are made with elevator at or above 1.3 Vso as long as you remain within five knots of the target airspeed. Long-term adjustments, e.g., going from flat to rising or descending terrain, are made with power. Flaps. Flap settings are dependent on chosen airspeed. Under Vfe, half-flaps should generally be used for increased stability and a more nose-down flight attitude. Trim. Trim is used exactly the same as always, to neutralize control pressure once your desired airspeed has been locked in. Maximum RPM. Contour flying that will -- or could -- require full power during the maneuver will demand full flat pitch prior to its instigation. An example of this would be when you have to go down in a deep canyon for an air drop with an immediate climb-out over obstacles after the drop. High green. Normal contour flying which requires a fair amount of maneuvering will work best with the prop set at the top of the green. This allows a more refined ability to adjust engine drag or power, as well as the ability to go to a fairly high manifold pressure on demand. Low green. Run-of-the-mill contour flying, as you might do under a clearly-defined 200 foot ceiling down a flat river valley over gravel bars, will not require anything but your normal cruise power settings. 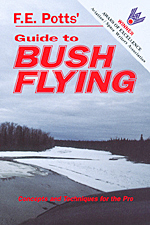 Prior to making any but the most shallow banks during low-level flight, e.g., around gentle river bends, or when lifting a wing over a bush or small tree, you are going to have to climb high enough to make sure you do not drag a wing tip. For most airplanes operated in the bush, a general rule of thumb is to use around 25 feet -- half wing-span, plus seven additional feet for granny. It doesn't hurt, though, to go a little higher if you are not in a takeoff or landing maneuver which precludes this, for you should make a habit of allowing yourself increased margins whenever the opportunity presents itself; this is what the more experienced pros do. Slow the airplane to below Vfe. Set the prop for maximum RPM. Apply 20 degrees of flaps while slowing to a speed ten knots above the power-off stalling speed noted in the airplane's flight manual for a 60 degree bank using this flap setting. Note that this speed varies with the airplane's current center of gravity. Move over to the side of the canyon. The right side is usually preferable so the turn can be made to the left. The distance from wing tip to canyon wall under critical conditions in still air should be no less than fifteen to twenty feet. Roll into a steep turn with a bank angle of 60 degrees. Almost full takeoff power will be required to maintain altitude and airspeed. When the turn is completed return to normal flight procedures. This type of turn, once mastered, will allow you to operate safely in a very narrow canyon. The turning radius is naturally determined by airspeed and, therefore, air-stability conditions. A little practice at altitude will demonstrate the techniques and its space requirements. Experience will take care of the rest. This winds up our review of the basics, so let's move forward in time about seven weeks from the kids' air drop and take a look at hunting season. Hunting season is always a busy and interesting time of year (in many ways, much like a circus), and a good portion of the bush pilot's yearly income is earned during this period. We came over the ridge just as the light of early morning began to flood the narrow valley, the Cessna 180 stable and comfortable in the cool smooth air, and there the two rams were, just where Ray said they would be. Then they spotted the source of the disturbance to their solitude and began to move. Momentarily, I felt a sense of empathy, then smiled as I saw the path they were picking. They were old and wise, and had our number. "What do you think?" Ray called to me over the sound of the engine, his two German hunters in the rear busy with their binoculars. "Can we get close to them?" I watched the rams for a moment as they moved rapidly along a narrow ledge about 500 feet below the ridge, heading into a tight V-shaped dead end: an easy place to get an airplane in, but a hard place to get it out; and far below them was tumbled moraine leading to a small gently-flowing creek. "Yes," I said. "But we'll get only one pass, so make it do." Ray looked at me; he, too, was a pilot (his Super Cub had had an unfortunate encounter with some squirrelly winds and a gully a few days ago, which was why I was flying him); then he nodded. He knew the score, had added the numbers up, knew what they meant. Perhaps that was the reason behind the grim look on his face. It was a tight spot, no question about it. Possibly one where he would not want to be flying himself. Then we were at our IAF, and I came back on the power, flattened the prop, set in 20 degrees of flaps and reached my 60-degree-bank stalling speed plus five knots just as we came up on the rams, passed them at about 20 feet horizontally and five feet vertically, then rolled into the turn with almost full power. The sloping walls of the canyon rotated around us, looking almost as though we were about to land on them, brush them with our wheels, then we were clear and headed down the valley, leaving the rams behind. Ray turned in his seat and asked his hunters, "OK?" Their answer was lost in the sound of the engine, but it did not matter. Even the glimpse we had caught before entering the final portion of the approach had been enough. Needless to say, their binoculars had remained unused -- as both Ray and I had known all along would be the case. They had got their close look. A look perhaps somewhat closer than anticipated. And Ray flashed me a subtle smile. He knew how tight the turn had been, how close to the walls we had had to go to accomplish it. We were fortunate our hunters had found something to distract their attention. That V-shaped area of the canyon was not a place to go if inexperienced...either as a pilot or passenger. It could be hard on one's dreams. At best. Our destination now was a gravel bar about 30 miles away on the wrong side of the river, one suitable for a heavily-loaded C-180. I would leave them there and return to base for the Super Cub. With it I could get them within "reasonable hiking distance." And I would wish them luck -- they would need it. Those two rams, old, wise in the ways of hunters, intelligent, were a worthy challenge. Late afternoon, two weeks later. The air was smooth with a high overcast, and ahead of us was Chickaloon pass, closed on the Anchorage side due to weather. The C-180 purred along smoothly and we were starting our climb to go on-top, join the GKN-BGQ airway, then make an instrument approach into Anchorage, when one of the Germans pointed outside the plane at something he wanted to take a look at. His eyes were as good as his hunting abilities, as good as the ram he had gotten, and far below us a small brown spot moved across the muskeg, paused, then began digging at something. So we lazily circled down in the fall colors, came to our IAF behind the bear, a fine Toklat with unusual markings, and approach began to turn into pass before he heard us, realized he was not alone, stood, and swatted at the large mosquito (Alaska size) that had suddenly shown up. Their ability to move fast, the snake-like sinuous flow of their movements, never ceases to amaze me. Then the pass was over and we were at our go-around point, starting our climb, the rule here, as always, being one pass only, for it is not good to disturb game without real reason. "Once more," one of the Germans said. "Please." He made a slight movement with his hand. In it was a movie camera. A reasonable request. So I continued on up to 200 feet, made the turn, passed through our new IAF, made the pass as the bear once again stood up and swatted at us, a fine animal, then we were past and had reached the go-around point. And as the power was gently applied, Ray turned around and asked, "Do you want to hunt it? We can land back at the river." "No," said the German who had not taken the pictures. "Not this time. Maybe next year." "Well," Ray said, "you both got good rams. One will go high in the book. I guess that is enough for one season." The German with the camera smiled. "We will not be entering them," he said mildly. "It is the competition with oneself that counts, not others. That is all that matters." None of us had anything to say to that. It was the pro attitude. The best hunters had it, as did the best pilots.